Ellen J. Hagopian, MD, FACS is a Hepato-Pancreato-Biliary Surgeon from Hackensack University Medical Center in Hackensack, New Jersey. 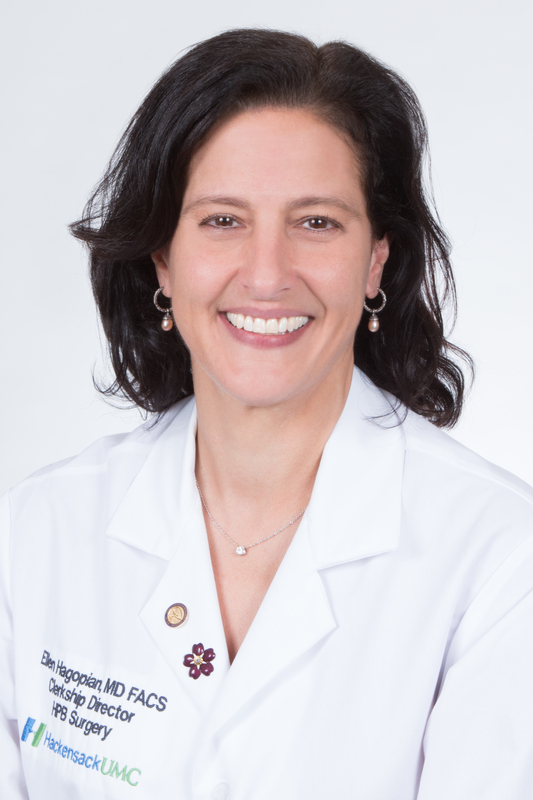 In clinical practice for 16 years, her practice spans both benign and malignant diseases with an emphasis in minimally invasive surgical approaches. Dr. Hagopian completed her General Surgery Residency at Columbia-Presbyterian Medical Center in New York followed by a Fellowship in Laparoscopic Surgery at New York Medical College. Focusing her interest in Hepatobiliary Surgery, she completed her surgical studies in Paris at Le Centre Hépato-Biliaire. She has been honored as a member of les Compagnons Hépatobiliaires, the international society of Hepatobiliary Surgery of Henri Bismuth. In addition to her clinical work, Dr. Hagopian is an accomplished educator and has been a leader in surgical ultrasound training for HPB Surgeons and Fellows. She currently holds the position of Chair of the American College of Surgeons National Ultrasound Faculty and Chair of the HPB-Abdominal Ultrasound Module. She also directs the annual AHPBA HPB ultrasound courses and chairs the Ultrasound Subcommittee of the AHPBA Education and Training Committee. Further evidence of her dedication to education, she is the Medical Student Clerkship Director at Hackensack University Medical Center. Dr. Hagopian is an active member of numerous other societies including the American College of Surgeons, the Society Surgical Oncology, the Society for Surgery of the Alimentary Tract, the Society of American Gastrointestinal Surgeons, and the New York Surgical Society, in addition to serving on the editorial board of HPB. Her research interests focus in education with an emphasis on surgical ultrasound training and assessment.